"In class, Kenichi was a solid student-confident,organized and able to work well with others. The work completed demonstrated clarity and a logical progression of ideas. The written assignments and the understanding of various teaching concepts were excellent. In the practicum, Kenichi was systematic and clear yet flexible-a skill developed throughout the program. Through the week, the identified areas that needed work were improved upon. All students responded enthusiastically to the lessons"
"Kenichi's knowledge of teaching practices and his sound theoretical background recently picked up in Canada gave him the perfect basis to engage upon this course. In addition to this, Kenichi was able to share his knowledge of some of the modern teaching approaches in open discussions, which was a tangible benefit to the group as a whole"
"Kenichi was an active member of the group and made thoughtful and positive contributions to the input sessions. He displayed an extremely positive approach to his own professional development and was both open to new ideas and willing to evaluate, and to share aspects of his own current practice with the other members of the group." " Kenichi demonstrated a thoughful and appropriately critical stance towards materials, including those of his own design. He was keen to consider tasks and materials from a number of perspectives so that they could better support him in guiding his learners. 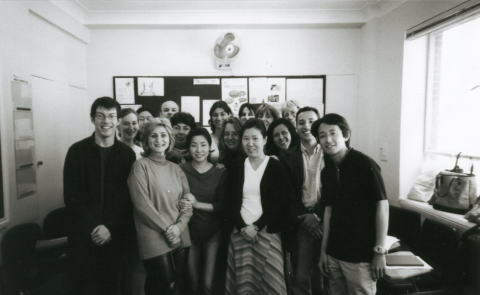 Working with Kenichi was also stimulating for me because of his energy and keen interest in professional development; our sessions on methods and resources for teacher development showed me that here was a teacher with high standards." I would like to thank all of the teacher trainers in Canada and the UK who helped me and supported me in my pursuit of effective English teaching. Copyright © ＫＥＮ−ＥＬＴ All Rights Reserved.